Taffy never goes out of style! Whether you’re young or old, you can’t resist a piece of our old-fashioned taffy. 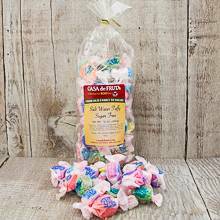 Try our chewy Sugar Free Salt Water Taffy today, and make sure to buy plenty to share with friends. It's so good, you won't believe it's sugar free. Packaged in a 12 oz. bag.